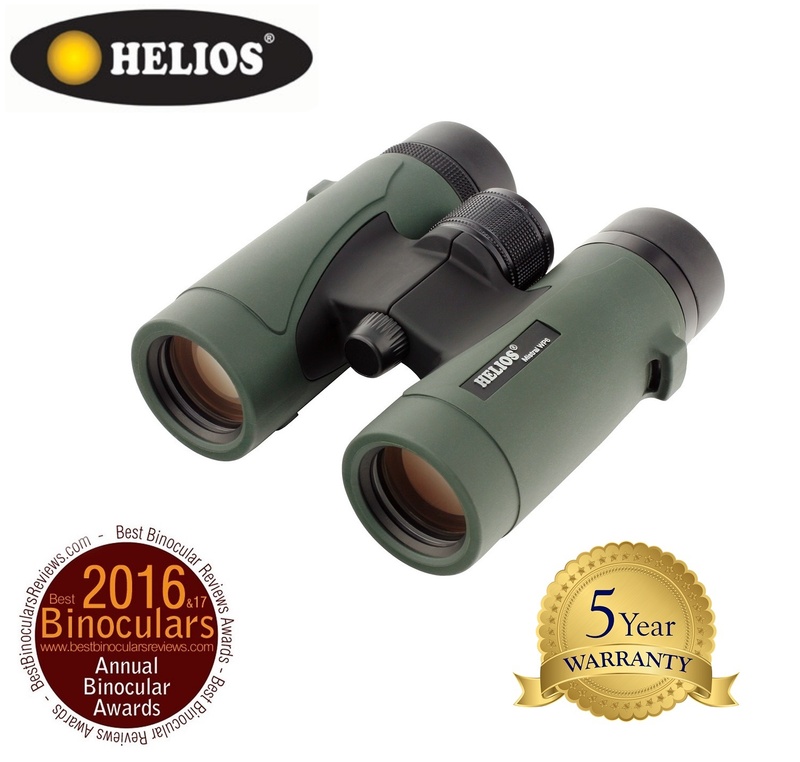 Helios Mistral WP6 12X42 Waterproof Roof Prism Binoculars are perfect for both bird watching and general observation. It is very stylish, ergonomic and modern top hinge design covered in sleek green rubber armouring. Its multi-coated optics and high quality BaK-4 roof prism maximize light transmission to provide excellent optical performance and deliver bright, sharp and crisp images. The body of this binocular is constructed from lightweight but robust polycarbonate glass which is helpful to reduce weight and make it durable. The large 42 mm objective lenses provide excellent light-gathering capabilities, making them a great choice for viewing wildlife when they are most active at dusk and dawn. It is purged with nitrogen to resist internal fogging, also water proof to perform well in all kinds of weather conditions. The twisted-up eyecups ring with 3-position adjust provide the most relaxing long eye relief for viewing with or without glasses. The long 17.8mm eye relief design offered viewer to see entire 4.4 degrees field of view clearly and effortlessly. It is a lightweight, versatile, compact and robust body protects it against pumps. This binocular had an integral tripod bush for convenience and hand free applications. The new, highly specified Helios MISTRAL WP6 roof prism range comprises ten models over 32mm, 42mm and 50mm objective lens apertures. They are extremely competent instruments for both birdwatching & general observing, and represent truly amazing value. They feature a very stylish, ergonomic, modern top hinge design covered in sleek green rubber armouring. The body is constructed from lightweight but robust polycarbonate. All models feature high-index, silver-coated BaK-4 prisms and fully multi-coated optics which provide excellent optical performance. Images delivered are crisp and sharp, with very good resolution, brightness and depth of field, whilst maintaining colours to a natural level. Near focus capability of all models is 2.5m or less. Waterproof and nitrogen filled for clear, fog-free operation. Twist-up, 3–position eyecups with metal sub-structure. Suitable for spectacle wearers. Knurled metal, easy-grip 2-turn focusing knob. Integral tripod bush. Supplied with neck strap, eyepiece rainguard, objective lens caps and soft case. 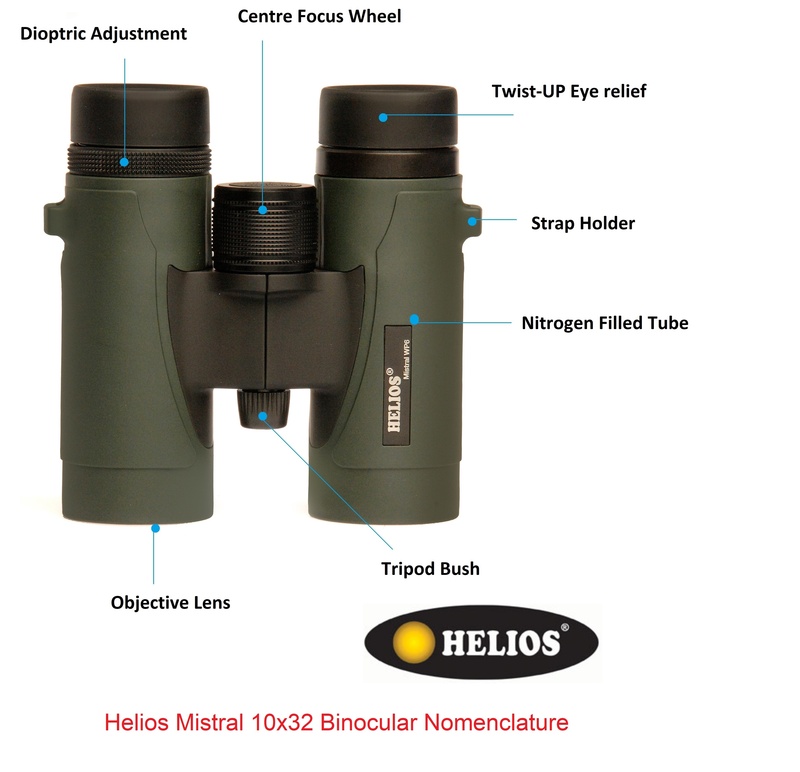 For more information about, Helios Mistral WP6 12X42 Waterproof Roof Prism Binoculars website.